Unemployment Looming? Make A Layoff Contingency PlanEliminate The Muda! Unemployment is approaching record highs. At 9.7% we have not seen these numbers since the early 1980’s. Right now there are nearly 15 million Americans that are out of work. Following the monthly unemployment reports it appears that we are past the worst of the recession with 217,000 layoffs last month down considerably from the 600,000 to 700,000 we were seeing in the past year. Is the scare over? Not by a long shot. The economy is not recovering fast and many more are still likely to lose jobs. 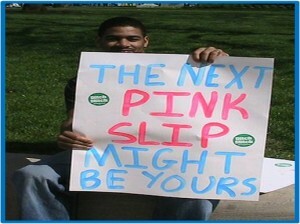 If you get the dreaded pink slip, are you prepared, do you have a contingency plan in place? Hopefully when the pink slip comes you are thinking clear enough to get everything out of your employer before you leave. Following the 6th Principle of Financial Management you know that everything is negotiable. Ask if you can stay on the company health plan, if they are willing it may be more cost effective than individual or COBRA insurance. You have earned vacation, personal or sick time, ask for it. Were there some hours in the last year that you worked but didn’t document, ask for it! Did you complete a big project that was successful. it may have warranted a bonus, ask for it! You won’t get it if you don’t ask for it. Next on a contingency plan should be options regarding immediate employment. You may already have a contact in mind that is willing and ready to hire you. If so you have the biggest challenge licked. Otherwise considering the fact that there are currently 6 unemployed people for every job available you may need to be prepared to survive for a time. So while you are looking for a job, what needs to be done to survive? Internet – Have a laptop? Use free wireless at libraries, coffee shops and hotels. It gives you reason to get up and get out each day. Avoiding your 401K and retirement accounts at all cost, you now need to take stock of how much liquid cash you can pull together. With this amount determine how many months you will survive covering your rent/mortgage and other minimum obligations. If you are looking at days, weeks are even just a few months you may want to consider contacting your creditors. Showing creditors that you are responsible up front will likely garner better cooperation from them when and if you really need it. If the need is now, talk to creditors about temporary alternatives. Maybe your mortgage company will accept interest only payments for a period of time. Banks or lenders my permit you to forgo a few payments altogether. You just never know until you try! Next you need to consider protecting yourself and your family from additional catastrophic problems such as health. If you were covered under a health care plan you will have the option of signing up for COBRA. The Comprehensive Omnibus Budget Resolution Act provides you the opportunity to continue your group health care insurance for up to 18 months after being laid off. If you had life insurance or accident insurance through your employer you may also be eligible to convert to a personal policy within 30 days of your termination without having to get a physical. While both COBRA and personal life and accident insurance will not be inexpensive the other side of the risk equation is potentially catastrophic! Odd jobs – You must keep yourself and your mind busy, are there opportunities in the neighborhood to generate a little income and keep you busy? Sell stuff – Have an extra car lying around? Maybe you have an old baseball card collection or stamps you don’t really need. Take an inventory of your possession and consider getting rid of stuff to generate cash. Regardless of how tough times get remember you are not alone; there is always someone that can provide some help and assistance. Don’t forget your family and your church.